post: very pleasantly surprised by how this was received, especially because there is no subject. fwiw, it is 3 exposures each processed differently in topaz detail, then blended. thank you for the kind comments and faves. This is very nice. I've noticed that in 99.9% of these HDR shots, they all seem to have an edgy feel that seems to jump right out and knock you over. Even in the images where a peaceful lake was photographed, it still has that knockout punch. You have somehow found a way to display the serene in a process that just doesn't seem conducive to that. This is just my opinion. Nice job. what I like about this so much is that despite having a full frame of wood and creek it does not all blend together. It can breathe, and feels natural. Message edited by author 2009-09-30 14:11:32. I love this photo and am surprised it didn't do better in the challenge. I have no idea why, but perhaps b/c it may have been, as you said, not HDR-y enough. Shame. Composition, detail, colour... all wonderful, although, perhaps not enough colour for the DPC audience. That said, I wouldn't change a single thing in the image. Love it. Incredibly rich; it has tooth. 2 wrongs may not make a right, but 3 subtleties can make a splash. I thought it was hdr-y plent-y! I loved the depth and sharpness you got out of the entire photo. What wonderful clarity all the way to the back. Beautiful shot. Very peaceful place, wonderful shot. Actually a good job of bringing up detail in the shadows and containing bright highlights. The image needs a focal point and another one or two elements of interest. 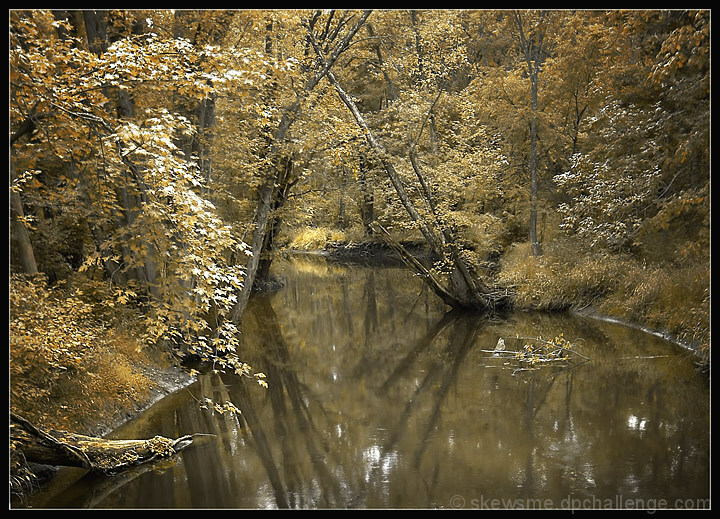 I love the soft brown tones, the reflections, and overall feeling of peace this image conveys. Beautiful composition as well. I really like the usage of the technique here. My outtake was a building in an area heavily shaded like this. I have tried a number of times now to get a photo I like, where the subject stands out from the surrounding trees, but I can never nail it, even using HDR. Perhaps you can share with me what you did on this one? You've done a good job with a shot of "nothing" essentially, and made it "something" - you've conveyed the feeling of your title very well. beautiful! love the muted tone of this. soft and beautiful! I like it! Proudly hosted by Sargasso Networks. Current Server Time: 04/18/2019 04:19:52 PM EDT.